After six years with the same Kindle Paperwhite design, Amazon finally changed things up a bit with the release of the Kindle Paperwhite 4. At its core it’s still mostly the same as the previous Paperwhite model, but the changes they did make bring it closer to the Kindle Oasis than ever before, and yet the Kindle Oasis sells for nearly twice as much as the Kindle Paperwhite. Two of the main selling points of the Kindle Oasis are the extra storage space and the fact that it’s waterproof—now those are things the Kindle Paperwhite offers at a much lower price. The Paperwhite 4 also adds Bluetooth to listen to Audible audiobooks and inverted mode to read with white text on a black background—both are features the Kindle Oasis is known for having. Both also have flush glass screens now too, with 300 ppi. The Kindle Oasis still has the advantage of having a slightly larger 7-inch E Ink screen to the Paperwhite’s 6-inch screen. It also has a unique design and an auto rotation sensor to use the page buttons on either side. Is that enough to warrant double the price? The software features are virtually identical between the two models, with the exception of Large Mode on the Oasis to scale things up for the larger screen. The Kindle Paperwhite 4 is by far the best value Kindle in terms of overall features and price, but the Kindle Oasis’s larger screen is nicer to look at and the page buttons are a plus. Here are the links to the Kindle Paperwhite 4 review and the Kindle Oasis 2 review for a closer look at each. Below is a list of the main similarities and differences between the two. 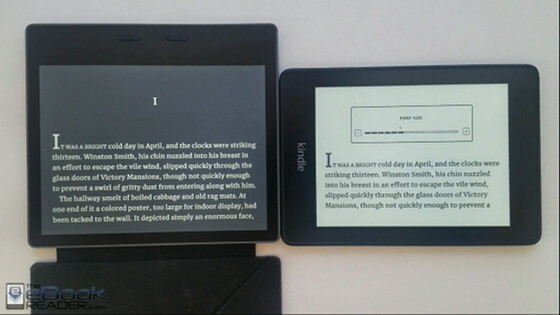 Both have 300 ppi E Ink Carta screens, and with the frontlight off text clarity appears about the same. Both are waterproof – IPX8 rated. Both have Bluetooth to connect speakers and headphones to listen to Audible audiobooks. Both come with 8GB of storage space, with the option for 32GB. Both have flush glass screens, although the Paperwhite’s screen appears to show reflections and fingerprints a bit more. Both have Wi-Fi with the option to buy a cellular wireless model. Both offer the same Kindle reading features. Auto-rotation sensor to switch between left and right handed reading. The frontlight is brighter with 12 LEDs compared to the Paperwhite’s 5 LEDs. The Paperwhite’s screen background color appears lighter, whereas the Oasis’s screen background has a yellowish tint to it. When comparing both devices with the frontlights on at similar brightness levels, the text looks clearer and sharper on the Oasis’s screen. Frontlight has auto adjusting sensor and nightlight mode to gradually decrease screen brightness at night as your eyes adjust. The Oasis has an unusual design that’s thicker on one end than the other, and it has a more premium feel with an aluminum back. The Oasis has Large Mode to increase interface text size and some images. The Oasis is available in silver and gold colors. The Kindle Oasis weighs 194 grams and the Paperwhite weighs 182 grams (191 grams with cellular wireless). Price: The Kindle Oasis 2 starts at $249 for the 8GB model with Special Offers and the Kindle Paperwhite 4 starts at $129 for the 8GB model with Special Offers. Both cost $20 more for the non-ad versions. Compared to PW1 (as in my case) I may justify the difference. However, after face to face comparison with PW4 not so much. Yes, 7″ is great. I do not care much for aluminium body and the rest is more or less the same. Is 1″ worth of 100% increase in price? I am not sure. So, if I should decide today between the two most probably it would be PW4 or some 10″ with Android 6.0 and front light. In the meantime, I will be more than happy with my O2. The physical buttons are important to me, and I often read coding books and references so the 7″ screen is more usable for me. I can easily justify the price for those, but I was able to convince my family last year to combine all their gift giving inclinations for me into a single gift, so I didn’t have to buy it myself, but eventually I would have. My Oasis is litterally my favorite thing. I don’t think I would feel that way about the PW4. I didn’t feel that way about the Voyage, and that’s better than the new Paperwhite. I came to the decision, after weeks of internal dialog? That the PW 4 was not worth the update from the PW3….considering i wouldn’t be using the differences very often. So…instead, i bought a cheap Kindle touch. Partly because of the audio feature ( with audio jack, and tts), and partly because of the infrared touch display ( been a while since I’ve read on a Kindle with a pure eink screen)…and, for some reason….I’ve always wanted a touch. I went from the Kindle Keyboard to the PW2. I went from a PW3, to a gen 1 Oasis, and now the Oasis 2. The second gen Oasis is definitely my favorite of the 3. I love having page turn buttons, as I often read on my lunch break, and with them I don’t have to worry about getting anything on the screen. I also appreciate the larger, 7″ screen size, and the faster processor makes everything feel just a little bit snappier. Don’t see myself upgrading anytime soon unless Amazon introduces another reader that keeps, and improves upon, these features. Page turn buttons are a big deal for me, as is the repeated reports of atrocious battery life on the new PaperWhite, but I’ll give Amazon a little bit to address the “days rather than weeks” reports I keep hearing as I could deal with annoying swipes for the price difference as long as the device itself were actually functioning as advertised. I need a replacement soon, still using an original 3G Kindle Keyboard that’s almost a decade old now, and it’s definitely coming to the end of its life at this point. You should know that the Oasis 2 has the same battery issues. They might even be worse. I read about 2 hours per day and have to charge at least twice a week. That’s not that big of a deal, bit if you aren’t used to it, it can be annoying. I returned my Oasis. It wasn’t a pleasant reading experience for me. The new Paperwhite is great though.